Am i the only one who didn't see this scene in the movie? 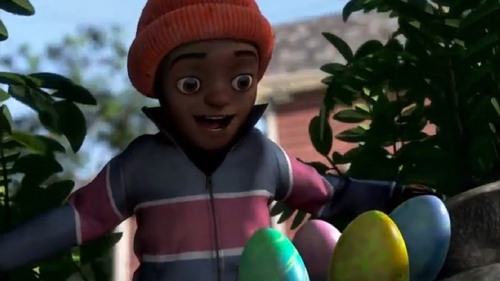 Bunny was hiding there in the bush at only one point in the movie...and that's when they stopped believing in him..so that kid did not find those eggs. Well, this scene was not shown in the film but you can catch this scene on DreamWorks "Meet Bunnymund", or "Rise of the Guardians Official Trailer One".Catch these videos on Youtube. No, you're not the only one that didn't see it. Now that I think back to the movie (thankfully, I saw it only yesterday), I don't remember that scene being in it. I mean when they can't see bunny any more. Sad! Err...... I don't see it, guys. It's not shown on the film, people. It's in the trailer. That scene was an introduction for Bunnymund.